William James DE FOOR [Parents] was born on 11 Jul 1842 in , Gilmer, Georgia. He died on 23 May 1915 in Ellijay, Gilmer, Georgia. He was buried in May 1915 in Pleasant Hill Cemetery, Marion, Alabama. William married Yother RITTENHOUSE on 22 Apr 1909. Yother RITTENHOUSE. Yother married William James DE FOOR on 22 Apr 1909. Lewis or Louis J. BLANKENSHIP [Parents] was born in 1822 in , Franklin, Virginia. He died in 1904 in , Franklin, Virginia. Lewis married Frances HAMRICK before 1845 in , Franklin, Virginia. Frances HAMRICK was born in 1825 in , Franklin, Virginia. She died in 1859 in , Franklin, Virginia. Frances married Lewis or Louis J. BLANKENSHIP before 1845 in , Franklin, Virginia. Sarah BLANKENSHIP was born in 1845 in , Franklin, Virginia. Louisa BLANKENSHIP was born in 1846 in , Franklin, Virginia. Ann BLANKENSHIP was born in 1847 in , Franklin, Virginia. M iv John Otey BLANKENSHIP was born in 1847. Isabella BLANKENSHIP was born in 1848 in , Franklin, Virginia. M vi Thomas Montague BLANKENSHIP was born in 1849. He died on 19 Sep 1907. Leroy PENCE was born on 24 Oct 1823. He died on 12 Dec 1864 in Battle of Monocacy - Civil War. He was buried in Mount Oliver Cemetery, Frederick, Maryland. Leroy married Ann Oliphant Walters WATERS. Ann Oliphant Walters WATERS was born on 25 Dec 1825. She died on 28 Jul 1899. Ann married Leroy PENCE. F i Mary Ann PENCE was born on 13 Apr 1846. She died on 9 Jul 1907. Monroe Napoleon Bonaparte DE FOOR [Parents] was born in Nov 1845 in , Habersham, Georgia. He died on 20 May 1901 in Hackleburg, Marion, Alabama. Monroe married Aria CRAFT on 1 Jul 1872 in , Gilmer, Georgia. Aria CRAFT was born on 1 Aug 1850. She died on 9 May 1903 in Hackleburg, Marion, Alabama. Aria married Monroe Napoleon Bonaparte DE FOOR on 1 Jul 1872 in , Gilmer, Georgia. Girdi DE FOOR was born on 16 Apr 1873. Cecil Cortez DE FOOR was born on 25 Dec 1874 in , , Alabama. Walter Henry DE FOOR was born on 13 Apr 1877. Martha J. DE FOOR was born on 27 Nov 1877 in Winston, Alabama. Andrew Jackson DE FOOR was born in 1880 in Winston, Alabama. Letty DE FOOR was born on 2 Aug 1882 in Winston, Alabama. Barbara Sylvania DE FOOR was born on 5 Mar 1887. DE FOOR was born in 1889. Monroe Napoleon Bonaparte DE FOOR [Parents] was born in Nov 1845 in , Habersham, Georgia. He died on 20 May 1901 in Hackleburg, Marion, Alabama. Monroe married Malia Melvina FRESBEE on 10 Mar 1865 in , Gilmer, Georgia. Malia Melvina FRESBEE was born on 20 Oct 1841. She died on 27 Mar 1928. Malia married Monroe Napoleon Bonaparte DE FOOR on 10 Mar 1865 in , Gilmer, Georgia. Thomas e. DE FOOR was born on 20 Sep 1866 in Elijay, Gilmer, Georgia. Archie B. DE FOOR was born on 6 Aug 1868 in Elijay, Gilmer, Georgia. Ida E. DE FOOR was born on 22 May 1871. Manson DE FOOR [Parents] was born in 1846 in , Gilmer, Georgia. Manson married Aby. Aby. Aby married Manson DE FOOR. George Washington DE FOOR [Parents] was born in Jun 1849 in , Gilmer, Georgia. He died on 27 Jul 1923 in Hackleburg, Marion, Alabama. He was buried in Middle Church Cemetery, Marion, Alabama. George married Martha. Martha was born on 27 Dec 1849. She died on 26 Nov 1907 in , Marion, Alabama. She was buried in Middle Church Cemetery. Marion, Alabama. Martha married George Washington DE FOOR. Charles DE FOOR was born in 1872. James DE FOOR was born in Jun 1872 in , , Alabama. Minerva DE FOOR was born on 24 Jul 1872 in , Gilmer, Georgia. Susan DE FOOR was born about 1874. Boyd DE FOOR was born about 1878 in , , Georgia. Wayatt DE FOOR was born about 1880 in , , Georgia. Rosa DE FOOR was born in 1882 in , , Alabama. Daisey DE FOOR was born in 1884 in , , Alabama. Sidney DE FOOR was born in 1887 in , , Alabama. Blueford DE FOOR was born in 1890 in , , Alabama. John Wyatt DE FOOR [Parents] was born in Jun 1849 in , Gilmer, Georgia. He died in Dec 1879 in , Gilmer, Georgia. John married Mary "Mattie" L. CHARLES on 1 Sep 1870 in , Gilmer, Georgia. Mary "Mattie" L. CHARLES. Mary married John Wyatt DE FOOR on 1 Sep 1870 in , Gilmer, Georgia. John M. BUCKNER was born on 19 Mar 1850 in , Union, Georgia. He died on 29 Nov 1926 in , Gilmer, Georgia. John married Barbara Sylvania DE FOOR on 9 May 1869 in , Gilmer, Georgia. Barbara Sylvania DE FOOR [Parents] was born on 1 Mar 1853 in , Habersham, Georgia. She died on 11 Dec 1925 in , Gilmer, Georgia. Barbara married John M. BUCKNER on 9 May 1869 in , Gilmer, Georgia. Mary Jane BUCKNER was born on 5 Sep 1869 in , Gilmer, Georgia. 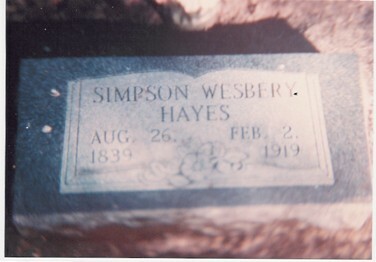 Simpson Westberry HAYES [Parents] was born on 26 Aug 1839 in 12 Dist. 37 Div, Habersham, Georgia. He died on 2 Feb 1919 in McKinney, Collin, Texas. He was buried on 4 Feb 1919 in Pecan Grove Cemetery, McKinney, Collin, Texas. Simpson married Mary Jane DEATHERAGE in 1860 in , , South Carolina. Mary Jane DEATHERAGE was born in Aug 1845 in , , South Carolina. She died in , , Arkansas ?. Mary married Simpson Westberry HAYES in 1860 in , , South Carolina. M i James Henry HAYES was born on 4 Jan 1883. He died on 25 Mar 1949. Mary J. HAYES was born in Jun 1885 in , Baxter, Arkansas. John C. HAYES was born about 1887.